“Down by the Riverside” is an African-American spiritual that dates back before the American Civil War. Songs were a major part of how geographic information was conveyed for the safe travel of slaves to the north during the times of the Underground Railroad. The reference to the riverside in the song, though originally referring to the River Jordan in the Bible, was believed to be a coded way to refer to the Ohio River, where slaves could find safe passage north. Spirituals provided more than just a physical map to safety, but also provided much of the inner, emotional support that slaves needed to feel protected and resilient in such difficult times. The songs told a story of freedom that later helped inspire black churches and communities in their political quest for equality and civil rights and became rallying cries for white allies. The broad theme of the song is to cast off aggression in the form of societal or group aggression or, in a larger sense, war among nations. Singers still sing this song at gatherings around the world where wars are being fought and people yearn for, hope for, and pray for, peace. We have selected it as the theme song for our third cornerstone curriculum theme “Resolving Conflict Creatively” because “laying down our sword and shield” is the beginning of using new skills to reduce conflict and to peacefully resolve problems. Peace is not only the laying down of weapons like swords and shields, or guns and bombs, but finding a positive place in our hearts that allows us to put a painful past behind us, grow beyond the pain and the hurt and learn to accept, trust and even love each other as people and countries. explore their own commitments to positive actions they can take in their communities. Process: Do a quick go-round where everyone contributes one word that came to mind while listening to the song. Explain that this song introduces one of our cornerstone themes for the Don’t Laugh at Me program: Resolving Conflict Creatively. “How many of you have had a quarrel, an argument a conflict or an unfortunate misunderstanding with a friend or a parent? (Ask for a show of hands.) That’s right. Pretty much all of us! Give a brief history of the song as provided in the “What to Know” section. The swords and shields of conflict between people are many but some of the most upsetting ones come about when the parties who are in conflict do not listen to each other, when they make it impossible for one party to have his or her story heard. Then the other party needs to be heard, and then some healing, some understanding and some “peace between people” can be created. This next exercise is about “laying down our “weapons” of disrespect, weapons that continue (prolong) conflict and can keep it from being resolved. Suggest that there is a conflict in which there is a misunderstanding between two children but that because of this misunderstanding, there has been a break in the friendship between these two students. Explain that one child thinks that the other one “dissed” or “disrespected” her because she walked away when she was trying to talk to her. Explain that the child who walked away actually was feeling sick and felt a little bit dizzy, that she/he was not dissing the other student, but had to leave to go to see the school nurse who realized that the student had a headache and a fever. When she returned to school after being sick her friend was angry and refused to talk to her. Ask two children to come up to play the parts of the children who are now trying to resolve their conflict. Each child sits in a chair and faces the other. In private, tell each student to talk continuously, look away, hum, put her fingers in her ears, etc. while the other student is trying to share her side of the story. Ask for two new volunteers. This time, let each party listen intently while the other one tells her/his story, narrative. Ask each student how it felt to have that exchange. Ask the “observers” of the two role-plays for their observations and insights. Explain that what they have just seen is a little “play” in which both parties in a conflict, “laid down their swords and shields”, allowed themselves to NOT try to win an argument, but listened to the other person’s story. Peace came about because they listened and learned that there was a misunderstanding. Have students work in a new pair to write a new verse for something you’re willing to do to make your classroom a more peaceful place starting with “I’m gonna. . .” Write the new words in black marker on a white piece of heavy stock (in the style of a cue card.) Hold up everyone’s cue cards and look around the room. “Down by the Riverside” is an African-American spiritual that dates back to the days of slavery before the American Civil War. The reference to the riverside in the song was believed to be a coded way to refer to the Ohio River, where slaves could find safe passage north. Spirituals provided hope and strength for people in such difficult times. People sang this song over the years during movements for civil rights and to end wars. K-1 Literacy and Art: Read Todd Parr’s The Peace Book. 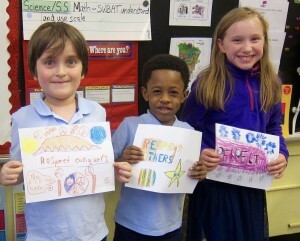 Have students create their own peace books. Start each page with “Peace is…” and have students write or dictate and draw illustrations. K-5 Art: Using mural paper, have students work together to paint a long, blue river. Give students construction paper and markers to draw something they could “lay down” by the riverside that would help create peace. (Laughing with friends, making someone a card, asking someone to play.) Glue pictures onto the painting of the river. K-5 Art: Read The Children’s Book of Peace: Children Around the World Share Their Dreams of Peace in Words and Pictures by Jolene DeLisa. Make a version of the book as a whole class. Have children write and draw or paint their ideas about peace. 2-5 Literacy: Read We Are All Born Free Mini Edition: The Universal Declaration of Human Rights in Pictures by Amnesty International. Have students write in their journals about one or two of the rights and why they are important to them. 2-5 Literacy, Math and Art: Read aloud Sadako and the Thousand Paper Cranes or Sadako by Eleanor Coerr. Teach students to make origami paper cranes. Encourage students to make paper cranes for a particular goal or wish, as Sadako does. If there is interest from students and a common goal, make 1000 paper cranes as a class and display them in the classroom. Alternatively, you can start a chain of paper cranes to be added to when students take steps to be peacemakers. These ideas can be adapted to a school-wide initiative. This is a good activity for 100-day celebrations. 6-12 History: Look at the body of African American spirituals and the coded messages they contain regarding the Underground Railroad. PBS has some terrific curricular materials including primary resources for exploring this theme. 6-12 History/Social Studies: Listen to the song in English, Hebrew and Arabic (link to Peter Yarrow and David Broza version). Discuss its application to the Israeli – Palestinian conflict. Consider and discuss additional cultural/social conflicts in the context of the song. 6-12 English: Provocative first hand accounts from slaves who escaped to the north are available online and through a book called When I Was a Slave: Memoirs from the slave narrative collection. The narratives contain more than 2,000 interviews conducted from 1936 to 1938 with elderly former slaves. In what ways do these stories help us understand the role of spirituals in keeping slaves’ cultural heritage alive and in helping slaves overcome the many obstacles facing them? Explore the differences between oral and written histories. In what ways is this history of singing, and specifically singing spirituals, still alive to this day? 6-12 Writing/Music: Ask students to write a modern day spiritual that addresses a social problem they would like to see fixed. Compare the history of spirituals to “storytelling” models of current music. Work with the music department to set these spirituals to music. Consider a special evening of theater and music to commemorate Black History Month using the narratives and music the young people feel they would like to share with the larger community.